Which restricts the end user in downloading files that are more than 5 GB of file size. We all know that Mega’s gaining traction day by day due to offering huge storage limits. 50 GB for free tier is a huge deal and no competitor is offering such speeds. But they do lack maintaining the user expectations over the service. One of the problem causing this is Mega Download Limit restriction which is capping users by displaying Transfer Quota Exceeded error. The bandwidth limit is only 10% of the total space offered for a Free Tier. As mentioned in the earlier articles, Mega is known for their speed and offering huge space on the cloud. But, such restrictions drive us away from using the service. In this article, We’re going to Bypass Mega Bandwidth Limit restriction which lets us download huge files with any transfer quota exceeded errors. 1 How to Bypass Mega Download Limit Transfer Quota Exceeded? 2 How to Bypass Mega Bandwidth Limit by Upgrading? 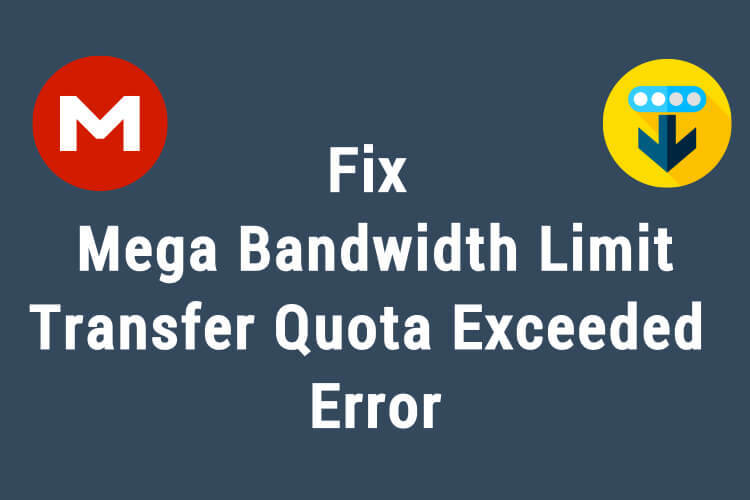 How to Bypass Mega Download Limit Transfer Quota Exceeded? If you had read the following article: Your Browser Storage for Mega is Full/out of HTML5 Offline Error Fix, You’ll get an understanding about how the service keeps track of such details. Copy the URL of the file along with the decrypted key or else this tutorial won’t work. If you’ve both separated append the key to the end of the URL with a # Symbol in between the URL and the Key. Next step is to Download MegaDownloader Latest Version and then follow the instructions on the page to get it installed on your PC. Once, the Installation is done and the software is open. Paste the earlier copied link and click on the download button. And, You’re done. Now you’ve technically bypassed the Mega Download Limit of 5 GB per Session/IP. The software comes with loaded features and is very stable at this moment. I won’t be boring you with all those details instead you can check them how secure Mega Link Downloader is at the time of downloading the software from the above link. Why has Mega put up such restriction in the first place which restricts the Transfer Quota? What solution do they provide in such situations? Here goes. How to Bypass Mega Bandwidth Limit by Upgrading? But unfortunately, that’s not a brilliant idea in the first place. Why the users opt for Mega, because of it’s huge storage limit. If he can afford to pay for such service he would have with the competitors like Google Drive or OneDrive. But the Mega Download Limit per IP still applies on MegaSync, What it does is paused the download for some time. And, resumes it after some time of expiry of Transfer Quota release for the account. If you don’t have one or it’s not pre-appended to the URL you might not able to download the files. The browser method also doesn’t work in this case. This Mega Download Limit Bypass works on all Windows Platforms including servers. For servers, you can check out: MegaDownloader Portable Latest Version if you don’t have admin rights. Most of the people will be using this on servers only because they offer faster speeds and this tutorial takes advantage of that speed without any transfer quota limits. A normal Mega Download Link consists of 2 parts: Actual file download link + decrypted key. In most cases, it’ll be a combination so there won’t be any issue but some people like to share their links separated from the decrypted key for security reasons. You can find more about it in mega cloud account while sharing files. Yes, It does 100% work. Just try and find out.